Or, Virtual Machines snapshot report export to csv file using VMware vSphere PowerCLI. 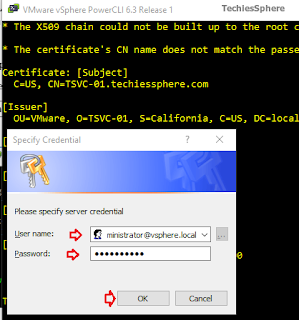 Or, Finding Virtual Machines with snapshot details using VMware vSphere PowerCLI. Or, vSphere PowerCLI command to get VMs list with snapshot name and descriptions. Descriptions: Remember the storage optimization task?, the very first thing we do is we check for the VMs having snapshot. Sometime we end up with having few VMs with very large snapshot data size. If you have 10-20 VMs, its easy for you to check each VMs individually to see which are the VMs having snapshot but what if you have 100 or 1000 VMs?? Its not possible or even not a wise decision to check each and every VMs individually for this reason. Once you connected successfully with your vCenter server, type the command below and hit enter. Now you will have the VMs List, Snapshot Name Details, and Snapshots Descriptions details as highlighted in below screenshot. Note: Please change the Export CSV path to your preferred folder path.